Imagine no possessions – I wonder if you can? John Lennon’s iconic song “Imagine” has been rated #3 on Rolling Stone’s list of the “500 Greatest Songs of All Time”. It envisages a world where elimination of some of the major things that divide humanity – religion, nationalism, and materialism – are discarded in order to achieve global peace and harmony. While the ideas delivered so powerfully in this song are immensely attractive at the conceptual level, things get a bit more nuanced when you take a cold, hard look at the details. Would any of us really want to try and live with “no possessions”? I don’t think so. And yet there are social changes afoot that are heading in that general direction. This fairly radical view of the future is based upon a growing recognition, especially amongst the millenial generation, that we don’t all need to own a copy of every possible consumer item even if we can afford to have one. Instead, it might be possible to enjoy almost exactly the same lifestyle as we do today by employing a technique which was common in rural agricultural communities not so long ago – it’s called sharing! Evidence of the growing popularity of this approach is everywhere. On a vacation in Chicago in 2010 my family used a bike-sharing system for the first time. 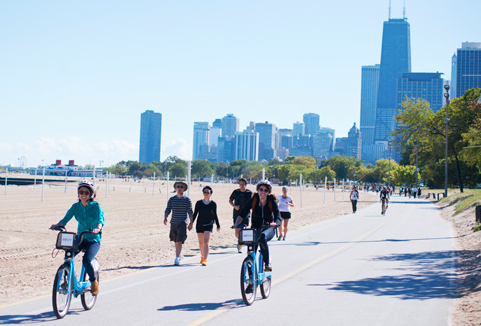 Unlike a traditional rental shop which requires you to pick up and drop off a bike at the same location, the Divvy system encourages you to pick up a bike from any of hundreds of locations, drive it to where you want to go and drop it off at a station near your destination. You can keep doing that as many times as you like in 24 hours for as little as $7. Over the course of a week various combinations of family members drove bikes throughout the downtown area and along the lakeside bike paths for more than 20 hours in total. The cost? $87 including taxes and some surcharges for trips lasting more than 30 minutes. The convenience and flexibility of the system really made it a pleasure to use (in 2015 I wrote a blog post on similar systems in Northern European cities and the Mobi system started operations in Vancouver in 2016). An identical strategy is taking place with car-sharing. 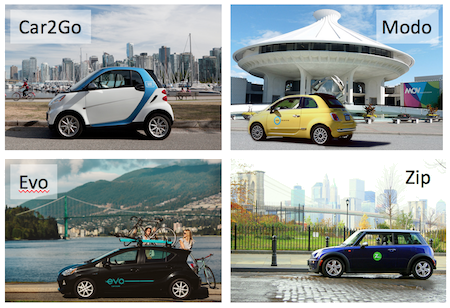 Here in Vancouver there are now no less than 4 car sharing systems available. As with the bike sharing systems these services allow you to locate the nearest available car using a computer or Smartphone app, pick it up and drive it to your destination where you simply leave it for the next system user. Car and bike sharing are really not that innovative in the sense that car and bike rentals have been around for a very long time. But what about specialty consumer goods? Do we all really need to have a full set of power tools? When was the last time you used a router, circular saw, or sonic stud-finder? And what about that deep fryer, chaffing dish, or food processor? No doubt it is handy to know that you have these items around in case you need them (if you can actually find them in some dark storage cupboard buried under other “essential” items – I often can’t). But even if you can afford to own them and even if you have a storage space for them think about this. What if we could avoid the enormous use of energy required to fabricate these items, package them and deliver them to a retail outlet if we just didn’t require as many? In order to try and assess what the potential savings could be I recently put together a video on the Fantastic Voyages of the Stackable Chair (See it on Youtube). The idea of sharing our precious possessions is more than a little bit disconcerting. And there are certainly things (like my 1975 Stratocaster) that I personally would not feel comfortable entrusting to the use of anyone but a very close friend. But there are many other things that I use but rarely that it would make sense to make available in some sort of sharing scheme. How much damage could someone do to my 20 foot aluminium ladder or my wheelbarow? There might even be a few items that I wouldn’t be too upset to see damaged or destroyed – the Garden Gnome I received as a gift from my aunt Matilda comes to mind. A recent article in a local newspaper here in North Vancouver described a new initiative which demonstrates how the concept could actually be put into practice as well as providing a great summary of the phenomenon that is becoming known as collaborative consumption. The benefits go beyond efficiency and a reduction in energy use. Sharing within a community, be it a University, neighborhood, or club reinforces the social connectivity within the organization and builds that most precious of social commodities – trust. I grew up in a rural community where helping neighbors take hay off the fields in the late summer was just expected behaviour. In the winter the outdoor ice rinks were built by volunteers. When the local recreation hall was destroyed by fire the entire community pitched in to build a new one. So I get the idea of sharing work. But the concept of collaborative consumption takes sharing to a new level. I am not quite ready to go “all in” with this idea. But I do find it intriguing enough to pursue it in some form or other. Any concerns I have are definitely not enough to overcome the reality that this is just the right thing to do on so many levels. Unrealistic? Probably. But what a fantastic tribute it would be to John Lennon’s vision and legacy if collaborative consumption reaches even a fraction of its potential.